The Southern Arizona Travel Guide is a resource for those planning a road trip or vacation to the region. The southern half of Arizona, including the metropolitan Phoenix and Tucson areas, is within the Sonoran Desert. While the region is extremely warm during the summer, mild, dry, and sunny weather is the rule from mid-autumn through mid-spring. This section covers the Tucson metropolitan area. This guide offers descriptions of many points of interest, links to many references, travel itineraries, and suggested visit times. See below for Metropolitan Tucson Points of Interest and the complete Index for this guide. Navigating the Guide - Open the Southern Arizona Map, or use the Southern Arizona Menu, or the Southern Arizona Travel Guide Index at the bottom of the page. The Tucson metropolitan area offers an exceptional outdoor environment for recreation. The city sits in a high valley with lush Sonoran Desert vegetation with wooded mountains reaching over 9,000 feet in elevation just outside the city. Mt. Lemmon Ski Valley is the southernmost winter ski area in the country. The presence of the University of Arizona brings much cultural activity. The Tucson area abounds with museums and parks. The Arizona Sonora Desert Museum, mostly outdoors in a natural setting, is one of the nation's most renowned museums. The city maintains a strong Spanish and Mexican heritage, having been part of Mexico until 1853. Mission San Xavier del Bac is absolutely the most beautiful and ornate of all the early Spanish Franciscan missions. Tucson has undergone enormous growth in recent years with many opportunities in dining, entertainment, vacation resorts, and cultural options. Arizona Guide (Arizona Office of Tourism) - Event Calendar. Tucson Weekly - Best of Tucson®, Cinema, Music, Arts, Restaurant Reviews, and Local News. AZStarnet (Arizona Daily Star) - Tucson's Entertainment Guide, Restaurant Reviews, and Local News. Metropolitan Tucson Convention and Visitors Bureau - Upcoming Events. Southern Arizona is especially noted for its many beautiful golf courses which have particularly excellent conditons in the winter and spring. Tucson is surrounded by great recreational and scenic areas: Catalina State Park, Coronado National Forest, Mt. Lemmon - Catalina Highway, Saguaro National Park which has a separate unit on each side of the city, and the much-loved Sabino Canyon. Sabino Canyon is a desert oasis in the Coronado National Forest right on the edge of town. Adjacent Bear Canyon is home to Seven Falls. Hiking is excellent; there is also tram service into Sabino Canyon. Tucson Mountain Park is west of the city via highly scenic Gates Pass. The park offers camping and hiking, and is also home to Old Tucson Studios and the Arizona Sonora Desert Museum. Colossal Cave Mountain Park offers a variety of guided tours inside the cave as well as other outdoor activities. Sabino Canyon (Coronado National Forest) - This is a Fee area (Note: Riding the tram shuttle requires an additional fee paid to the concessionaire, Sabino Canyon Tours). From the parking area, visitors must walk, bike, ride a horse, or take the shuttle bus into the canyon. The paved road is accessible to wheel chairs and baby strollers. The Pusch Ridge Wilderness Area begins immediately above Tram Stop 9. Sabino Canyon Tours - Tram shuttle & guided tour of Sabino Canyon Trail, non-narrated tram shuttle to Bear Canyon Trail. Tucson Mountain Park - Info on hiking trails, Gilbert Ray Campground, wildlife viewing, and archery, rifle, and pistol ranges. Tucson City Golf Courses - Operates five golf courses throughout the City. Golf Tee Times can be reserved on-line. Detailed information on each course, including history, hole layout, maps, rates, merchandise available at the pro shops, and contact information. The Tucson area offers an exceptional number of cultural venues, museums, and other attractions. The presence of the University of Arizona campus enhances the cultural environment. The Arizona Sonora Desert Museum is one of the nation's finest museums, and it is largely outdoors in a natural setting. A few miles away, the Old Tucson Studios offers wild west entertainment. The Pima Air and Space Museum offers an outstanding collection of vintage military aircraft. It also houses the 390th Memorial Museum featuring memorabilia from the World War II B-17 Bombardment Group. Mission San Xavier del Bac features the most beautiful and ornate of the early Spanish missions. 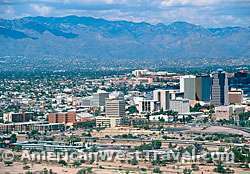 Tucson also offers symphony, opera, theater, and fine arts. St. Philips Merchant Farmer's Market - Saturday morning (click on Event Calendar for times). Southeast corner of Campbell Avenue and River Road. Features locally grown and produced foods, native plants and crafts. Tucson Farmer's Market - Features locally grown produce, plants and seeds, baked goods, meat, eggs, seafood, cheese, and specialty foods (check website for winter/summer times and for schedule changes). St. Philips Plaza - Sunday morning. Southeast corner of Campbell Avenue and River Road. Maynard’s - Saturday morning. Downtown at The Depot, next to Maynard’s Kitchen and across the street from local landmark Hotel Congress. Oro Valley - Saturday morning. Located at 11000 N. La Canada at the Oro Valley Town Hall, on the Southeast corner of La Canada Blvd. and Naranja Road. Jesse Owens Park - Friday morning. located at 400 S. Sarnoff Drive, just east of Pantano and south of Broadway on Sarnoff. Tucson Association of Museums - Listing and interactive map of museums in the Tucson Metropolitan area. Pima Air and Space Museum - Explore one of the largest Air and Space museums in the world where over 300 aircraft and exhibits are on display including the SR-71A Blackbird, a B-24 "Liberator" heavy bomber, a Mitchell B-25, Boeing B-52D Stratofortress, and President Kennedy's Air Force One. Also offers bus tours of the 309th Aerospace Maintenance and Regeneration Group, an airplane graveyard, also known as the "Boneyard". Titan Missile Museum - This preserved Titan II missile site, officially known as complex 571-7, is all that remains of the 54 Titan II missile sites that were on alert across the United States from 1963 to 1987. Location: 1580 W. Duval Mine Rd., Sahuarita, Arizona. About 20 miles south of Tuscon. 390th Memorial Museum - Features images, memorabilia (including a restored B-17G aircraft, called "I'll be Around"), and personal histories of the achievements of the 390th Bombardment Group, an Eighth Air Force unit that was based in England from 1934 to 1945. Arizona State Museum - The oldest and largest anthropology museum in the Southwest, established in 1893 by the Arizona Territorial Legislature and is the state’s official archaeological repository. Holds vast and varied collections focused primarily on the peoples of the American Southwest and northern Mexico. Kitt Peak Observatory - Guided tours are offered daily and group tours are available by appointment. Star gazing at the Kitt Peak Observatory is available through their Nightly Observing Programs. Location: Kitt Peak is 56 miles southwest of Tucson via State Route 86 on the Tohono O'Odham Reservation. Allow 90 minutes of drive time from Tucson. De Grazia Gallery in the Sun - A legndary landmark of southwestern art and architecture on the National Register of Historic Places, the adobe gallery features DeGrazia artwork, a gift shop, and the beloved Mission in the Sun. Tucson Museum of Art and Historic Block - Impressive permanent collection of art of the American West, Latin America, and both contemporary and modern art. Arizona Theatre Company - Schedule and ticket information. Arizona Opera - Performances and ticket information. Tucson Symphony - Performances and ticket information. University of Arizona Presents - Performances and ticket information. University of Arizona's Biosphere 2 - Guided 1 1/2 hour tours of the steel and glass facility that encompassases three acres and five biomes: rain forest, ocean, savanna, desert, and marsh. Old Tucson Studios - This replica of 1860 Tucson was the location for the filming of more than 300 movies, TV shows, and commercials. Highlights include stagecoach rides, live gunfights, stunt shows, musical revues, and exhibits. Tucson Padres (Minor League Baseball) and Cactus League Spring Training games in March at the Kino Sports Complex. Catalina State Park protects a choice section of desert on the western base of the Santa Catalina Mountains. The park offers excellent scenery with its lush washes, dense cactus forests, and a mountain backdrop. It is actually located within the Coronado National Forest though managed by the state of Arizona in cooperation with the U. S. Forest Service. Catalina State Park offers nice recreational amenities including a developed campground with hookups, picnic areas, an excellent network of trails, and an equestrian center. The trail system connects to the Sutherland and Romero Canyon Trails in the Pusch Ridge Wilderness Area, which steadily climb high into the Santa Catalinas, first through scenic desert canyons, then semi-desert areas with scrub oak and chaparral, and then progressively more forested areas as the elevation increases. Located just north of Tucson on the Oracle Highway. Time: spend a few hours or a couple of days. The Santa Catalina Mountains offer summer relief from the heat of Tucson and also features the southernmost ski resort in the U.S. at Mt. Lemmon Ski Valley. The Catalina Highway, or the Sky Island Scenic Byway, starts in the desert just outside of Tucson and climbs spectacularly, reaching a Canadian-like environment at near 9,000 feet elevation. The route reaches the resort village of Summerhaven and continues to the ski area, with access to various trails along the way. The drive is only about 28 miles from Tucson but reaches a completely different world. Location: scenic byway starts from Tanque Verde Road just outside Tucson. Time: expect at least a full day to go up and return. Saguaro National Park is separated into two units: the Tucson Mountain District located west of Tucson off of Kinney Road, and the Rincon Mountain District located east of Tucson off the Old Spanish Trail. Both units off scenery and recreation in an unspoiled Sonoran Desert environment. The Rincon's Cactus Forest Drive goes through an especially dense cactus forest with many examples of large, multi-armed saguaros which for many symbolize the American Southwest. The Saguaro and Rincon Mountain Wilderness Areas offer remote camping and hiking from the desert up to over 9,000 feet in the wooded Rincon Mountains. The Tucson Mountain District offers a nice network of interconnecting trails. These low lying mountains are covered with cacti and following a wet winter can be covered with gorgeous wildflowers. Its Red Hill Visitor Center offers a variety of interesting programs. Time: spend a few hours up to full day. The world-renowned Arizona-Sonora Desert Museum combines a zoo, natural history museum, and botanical garden, all in one facility. The museum is dedicated to the conservation of the Sonoran Desert which reaches from northern Mexico into southern Arizona. Its exhibits are almost entirely representative of this region. The museum exhibits plants, animals, fossils, and minerals of the Sonoran Desert region. The focus is on making maximum use of the natural surroundings. The lengthy Desert Loop Trail passes through unspoiled desert south of the main loop. The Earth Sciences Center features a simulated underground limestone cave. Located on Kinney Road across from Saguaro National Park. Take Speedway Boulevard west from I-10. Time: a half to a full day. Mission San Xavier del Bac was originally founded in the 17th century by the Jesuit missionary, Father Kino. The beautiful building (left) known as the "White Dove of the Desert", built from 1783-97, stands out like a beacon with its bright color. The murals and decorations inside the sanctuary have been refurbished in recent years and restored to their original beauty. With its domes, arches, and carvings, the mission is the most beautiful and unique example of early Spanish mission architecture. The mission and museum are open daily with self-guided tours. Located off of I-19, south of Tucson. Time: a couple of hours.